There's nothing in life quite like the bond between best friends. Whether you've grown up together or become fast friends as adults, a well-chosen quote is the perfect way to pay tribute to your special relationship.  From his Autobiography, "The Education of Henry Adams" (1918).  From her book, "Firefly Lane" (2009).  From her book, "The Status of All Things" (2015); posted on Facebook by the main character, Kate. It's an unwritten rule that best friends take care of each other, and best friends' husbands understand.  From her book, "The Status of All Things" (2015); said by Kate's best friend, Jules.  From her book, "Nobody Does it Better" (2007).  Dorothy Gale, played by Judy Garland, in the "Wizard of Oz" (1939).  The Monster, played by Boris Karloff, in the "Bride of Frankenstein" (1935). Dear George: Remember no man is a failure who has friends.  Clarence the Angel, played by Henry Travers in "It's a Wonderful Life" (1946). Only a true friend would be that cruelly honest!  Donkey, voiced by Eddie Murphy in "Shrek" (2001).  As quoted in The Dictionary of Cultural Literacy, edited by E.D. Hirsch, Jr., Joseph F. Kett, and James Trefil. Best friends have a unique history, complete with mutual interests, shared secrets, and inside jokes. Maybe you have fond memories of singing ‘80s songs on a road trip across the country to see some of our nation's famous landmarks. Maybe your favorite activity is simply relaxing with a glass wine and a cozy fire in your backyard as you rehash the events of the week. Show your friend how much they mean to you by choosing a saying that echoes these aspects of your relationship. 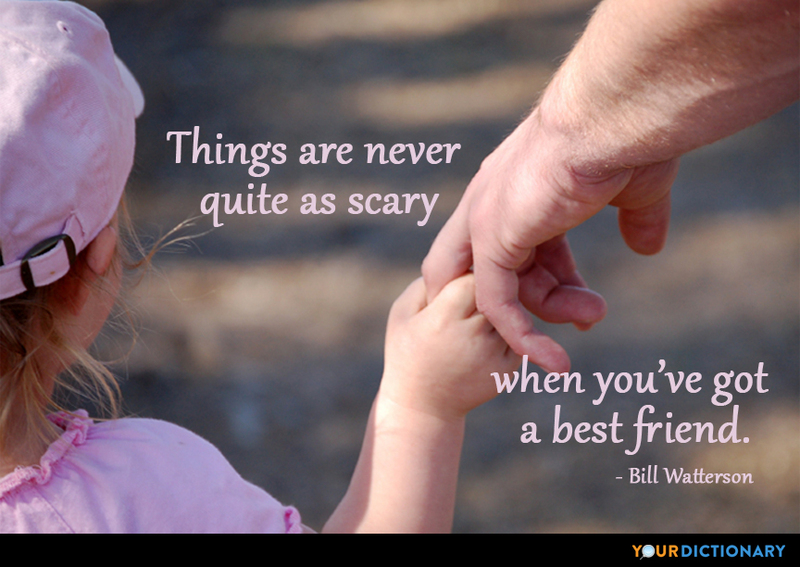 A best friend is someone you can turn to for comfort when times are tough. Perhaps your friend has helped you through a job loss, break up, or major illness. Perhaps they’re the only one who knows how to make you smile when your whole world seems like it's been turned upside down. 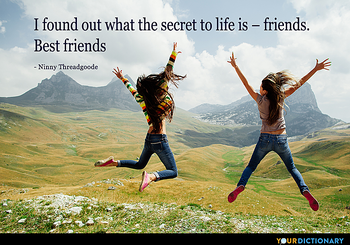 Best friend quotes that allude to helping each other through dark times are more serious in nature, but the sentiment is sure to be appreciated. In today's mobile society, it's increasingly common for friends to move away due to work or family obligations. Even if your best friend lives nearby, you still may not get to see each other as much as you'd like due to hectic schedules. 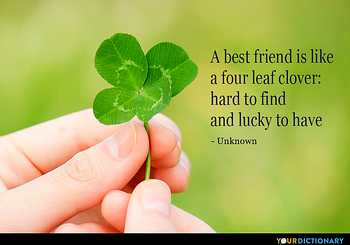 Connecting with a special quote lets your BFF know they’re always in your heart.